The Toxteth Hotel is located on the corner of Glebe Point Road and Ferry Road, in the inner west suburb of Glebe. 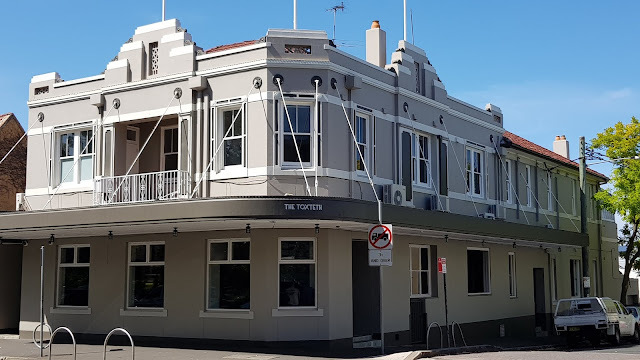 This heritage listed pub was built around 1925 in the Inter-war Free Classical style. This is a very interesting building - I don't believe I've ever seen this sort of architecture here in the States. Very interesting architechture! You are doing a great job of documenting your city! Have a great week! Thanks, Kelleyn. I appreciate that feedback. Grand old hotel, grand blue sky! Lovely old pub, there's a trace of Art Nouveau style there too.